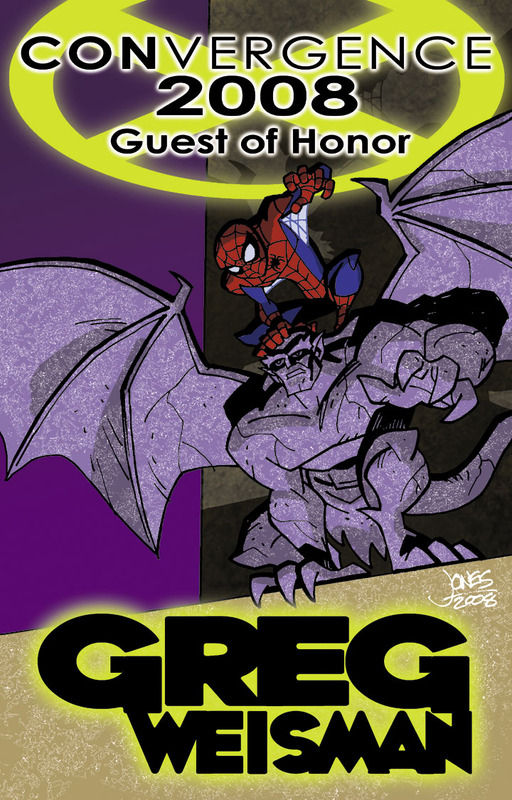 We’re counting down to CONvergence 2012 on July 5-8, sharing more art I’ve done for badges, specifically we’re still going through the badge art fro the massive number of Guests of Honor of CONvergence 2008. 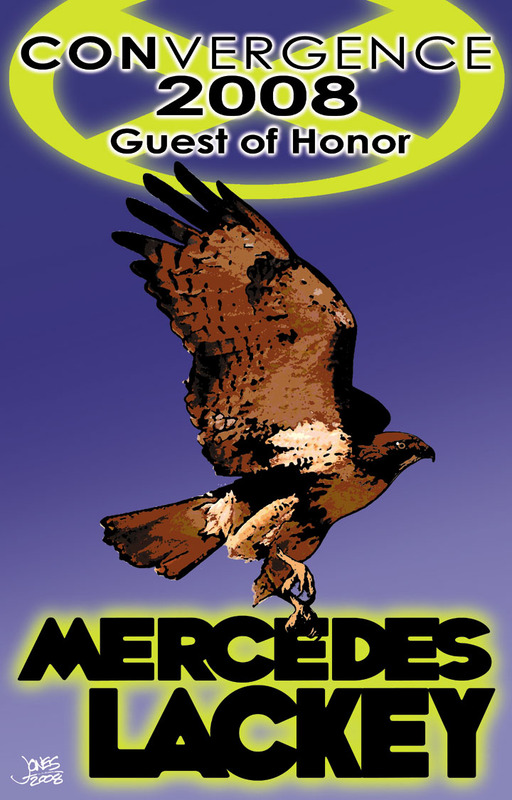 Another raptor image for Mercedes Lackey, making a matching set with the badge I did for her husband, Larry Dixon. 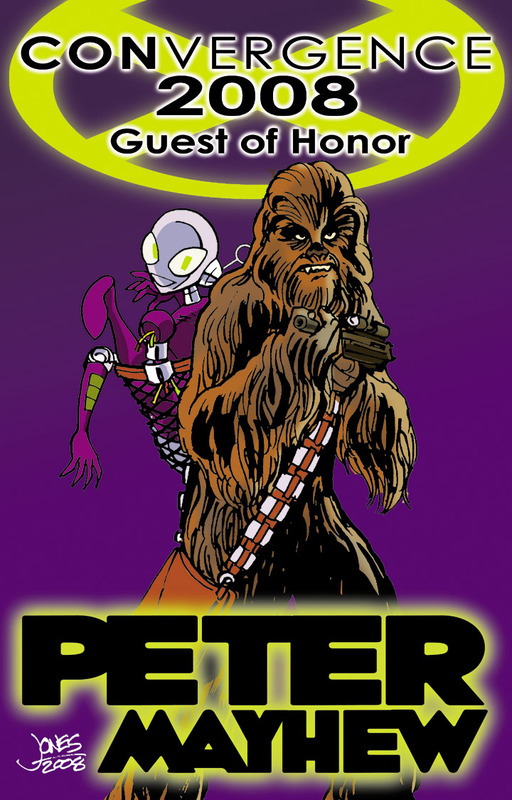 I’d thought of this image the first time Peter Mayhew was at CONvergence, but didn’t use it then because Peter didn’t know Connie yet. This time that wasn’t an issue. 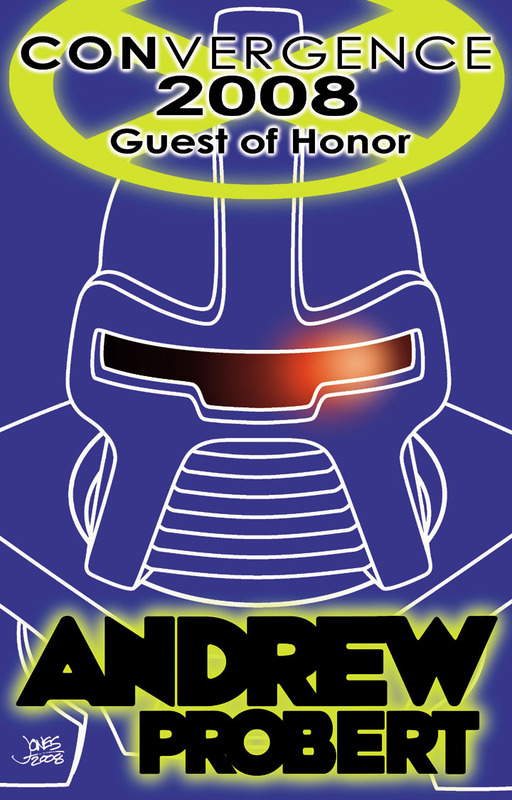 The first time we’d had designer Andrew Probert as a guest I’d referenced his work for Star Trek: TNG and Airwolf. This time I referenced his role as designer of the Cylons for the original Battlestar Galactica! 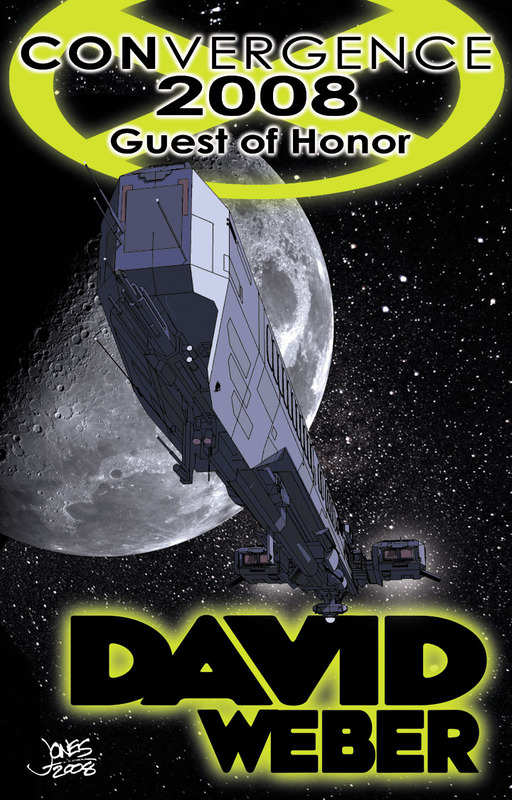 An Honor Harrington-esque spaceship for author David Weber. 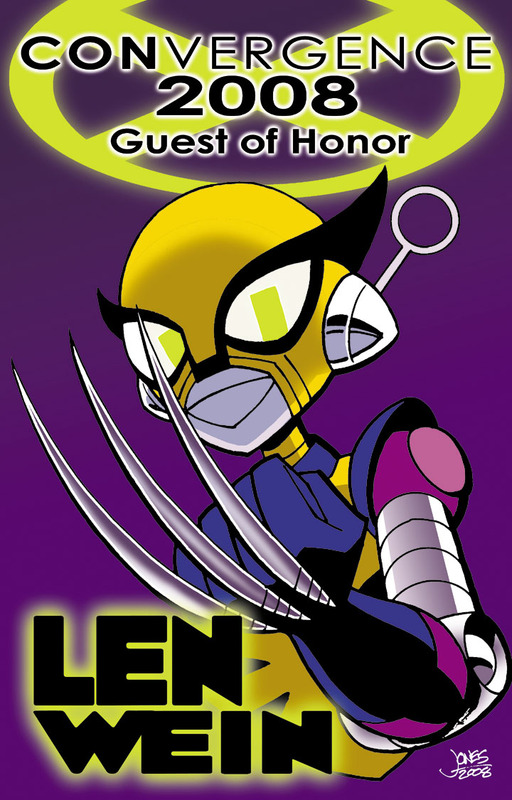 I had fun dressing Connie in the original costume of Len Wein’s creation, Wolverine. Spidey is about to get a surprise now that the sun has gone down on Greg Weisman’s badge, referencing his Spectacular Spider-man and Gargoyles animated TV series. One more batch from #CVG2008 to come!!! It’s the time of year where in addition to doing my usual day-job art chores, I’m getting ready for CONvergence, the Sci-Fi convention I helped start back in 1999 and still help to run. In addition to my other responsibilities I do a lot of artwork for the convention, including custom badge art for each individual Guest of Honor. As we count down to CONvergence 2012 on July 5-8 this year, I thought I’d share some highlights from past Guest of Honor badges. I’ll share this year’s badges after the convention – the Guests of Honor they are for get to see them first! At the time this was done, John Kovalic had been at the convention before and was a personal friend, making it much easier to figure out what to do for his badge art. 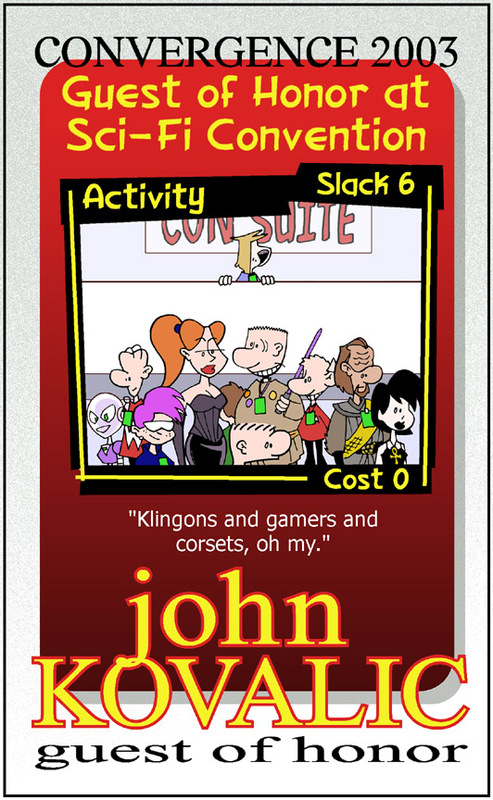 John’s badge is done in the style of his Chez Geek cards, and features characters from his Dork Tower comic at CONvergence. Andrew Probert is a production designer whose credits include the Enterprise-D for Star Trek: The Next Generation, and the Airwolf helicopter from the TV series of that name. Those two facts plus a recurring cliche from the Airwolf series provided the joke for this badge. Michael Sheard was also making a return appearance at CONvergence this year. The British character actor had appeared several times on Doctor Who over the years, including the story that introduced the Doctor’s robotic dog K-9. 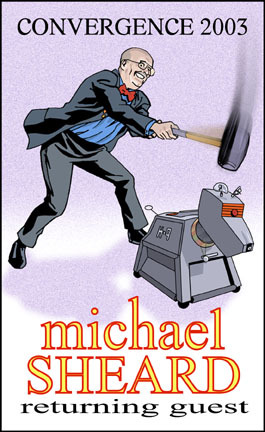 Michael famously had a love-hate relationship with that “tin dog,” given the remote-control prop’s never-ending malfunctioning on the set. More badge art coming tomorrow!